The era of glorious captains, glorious attacks, and glorious booty was now long past, and the conflict had become a kind of long and tedious chess game in which strongholds were besieged, changed hands, and were besieged again, bravery often counting for less than patience. So begins The Sun over Breda, a gloriously dramatic novel of war and honour that marks the return of international bestseller Arturo Pérez-Reverte's most beloved character, Captain Diego Alatriste, the seventeenth-century sword-for-hire who leads his formidable band of soldiers in the name of King Philip IV of Spain against the Dutch in the battle for Flanders. 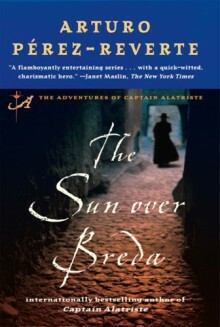 Narrated by young Íñigo Balboa, Alatriste's faithful, soulful mochilero, The Sun over Breda follows the throbbing pulse of combat fought on increasingly uncertain terms by an army growing more and more disenchanted with its king, and therefore less and less willing to risk life and limb for the cause. As Spanish blood spills into the Flemish canals, and the lethal flash of swordplay drains the men of their thirst for victory, unrest grows among the troops. With no promise of payment from the king, Alatriste is caught in the impassioned throes of mutiny, torn between fealty to the material needs of his men and his pledge to a crown for which he holds no love.